Food quality is degrading everyday, this world needs healthy food. A brand has now entered the market with its pure organic product range which will ensure good health of everyone. This is a long felt need of the market and now MSG Products are here to fulfill it. We all say that food quality is degrading day by day, most of us also know the reason behind it. Increase in use of pesticides, insecticides and other chemicals that are used to increase production of food are the main reason behind making the food unsafe for our consumption. This world needs the same organic food back, the food that was free from all these chemical. Many companies had made promises in the past to provide high quality food products to the customers but none of them dared to write "ORGANIC" on their product packaging. I mean how can they write when they are providing the same chemical infected food just like everybody else. The company has launched food products in three ranges - Organic, Premium and Standard. It has pure organic products means not even a single inorganic chemical has been added to the products marked as "Organic". A large list of products come under this range like Atta, Ajwain, Basmati Rice, Channa, Dals, Daliya, Sugar etc. Right now there is no other company which can stand in front of this pure organic range of MSG products, quality can never be better than this, no chemicals make sure that its the most healthy product range of the market. These are the products in which external chemical is added in very minute quantity just to make sure that the product doesn't degrade in short time span. The least harmful chemical is selected which can do the job to increase usable period of product unlike any other company where profit is the main concern while selecting additives. Many items like 9bar9 hair oil and 7sath shampoo which are receiving great positive feedback from customers come under this product range. As the name says, standard amount of additives are added but still they are better than other products of market as the raw materials used in its production are purely organic. Almost all products of the organic range are available in standard range too. Yes you read it right, first time a Saint is advertising for a brand. However he had clearly mentioned before becoming the Brand Ambassador that if the company fails to deliver the quality that they are promising, the very next second he's out of this program. Saint Ram Rahim has also taken a written notice from the company regarding this quality matter. He also does surprise visits to different parts of the manufacturing units of this company to see if everyone is doing their job right or not. While we seem to care for everything we own, we seem not to care at all when it comes to our most precious resource - our body. Saint Dr. Gurmeet Ram Rahim Singh Ji Insan, points this out dramatically in the first TV and online commercial that heralds the launch of MSG Products across India. We don't want to ruin our cars with spurious adulterated fuel, but do we even care about what we eat? Indeed, it is for this reason that India has become the Heart disease and diabetes capital of the world. MSG is the first brand to come out with an organic line of products, nationwide. This TV commercial send this message across so strongly that it may actually become a turning point in the way India looks at food. Finally, there are trusted products that fulfill the need of this health savvy segment with the best part being that the range suits all pockets. So, the constant fear of having poison in one's plate is taken care of. The packaging maintains the high standards to ensure safety of the food product. Saint Dr Gurmeet Ram Rahim Singh Ji Insan has constantly encouraged farmers to take up organic farming and has held farm fairs to disseminate appropriate know-how. The MSG products are also a step in the direction of having a healthy food business with eco-friendly and sustainable development at its heart. We have ignored the headlines of pesticide laced food often, but for our better health, it is time to make a responsible decision and switch to MSG. Conceptualized and created by Saint Dr. Gurmeet Ram Rahim Singh Ji Insan, this ad campaign has touched a raw nerve in the Indian market. No supplier, apparently was keen to explore the space for pure products, owing to the challenges. But as the first ad shows, MSG is poised to be a thought and market leader, for a long time to come. 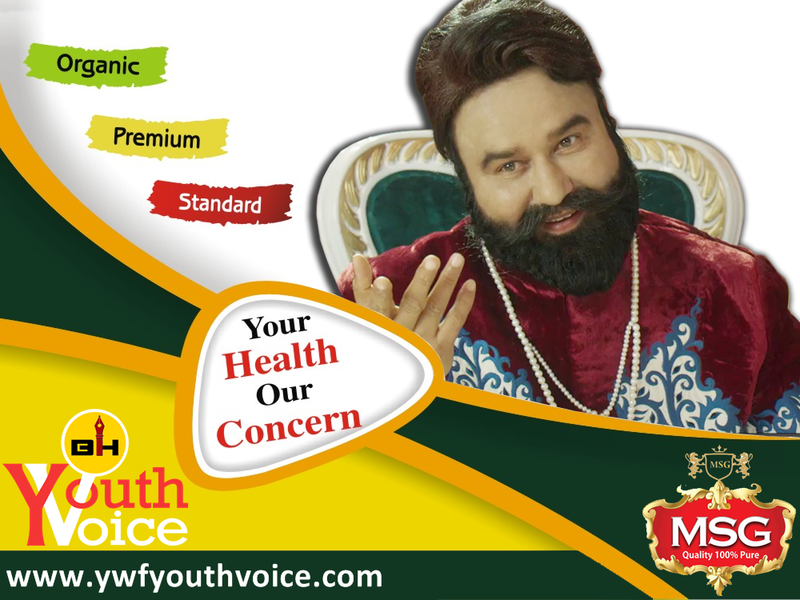 Commenting on the campaign strategy, the Spokesperson of MSG All Trading Company said, " MSG makes you realize that there is nothing more important than health, and food is its most important determinant. This is a long felt need of the market and now MSG Products are here."